The "girly" hero in the Japanese version of Nier was completely redesigned for other versions of the game because Square Enix was worried that American audiences wouldn't respond to a character who wasn't a "macho old guy." 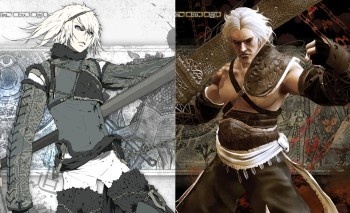 You'll notice, if you bother to look, that the protagonist in the Japanese PS3 edition of Nier isn't quite the same as the guy who turns up in the other versions of the game: One of them looks like the Kurgan while the other guy could be, well, a girl. There's a good reason for that: Square Enix was worried that the original character would look too "girly" for American and European gamers. "A heated discussion ensued once the American and European staff were gathered to discuss it," explained Nier director Taro Yoko. "It was said that 'a slender and girly protagonist like this couldn't possibly swing a huge sword like that, it's ridiculous.' Certainly, if you look at American games it's always muscle bound mains who look like they play American football." So why not just ditch the nancy-boy altogether? Executive producer Yosuke Saito said that while it would have been cheaper, cutting the "girly character" would have hurt the team and dragged out the development process even longer. "A lot of people were arguing for making only the macho old guy version for cost reasons, and we were saying, 'But if we don't make a girly version we'll lose heart and it'll take even longer'," he explained. "As a result, the Japanese PS3 version only became the girly version, and both PS3 and Xbox 360 international versions were the macho old guy versions." Hey, "the macho old guy" might be silly too but when it comes to cleaning house, I'll take that over the "skinny emo child" any day.